Home / Mental Muscle / Can You Imagine Your Way to a Win? Can You Imagine Your Way to a Win? 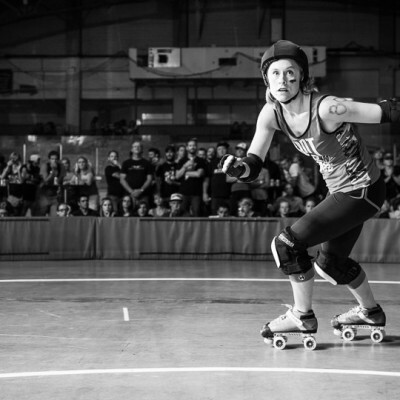 When you step back and take stock of all the things we do to be at our best in roller derby, the list can be surprising. We go to practice and scrimmages. We tweak our gear (bearings, plates, wheels, laces…). We tape. We crosstrain. We watch footage. We train some more… Some of it costs money, and most of it takes a load of sweat. But there is one training tweak that you’re probably not doing yet, and it is all but guaranteed to improve your game. It’s totally free and you can do it in your jammies (no, this time I’m not talking about sleeping, but I do talk about that here!). It’s visualization. It turns out you really CAN improve your game just by thinking about it! 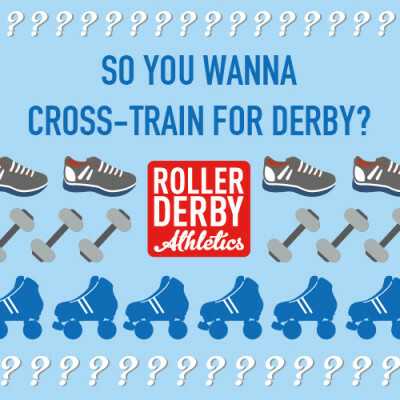 Now, I know some of you spend a LOT of time thinking about roller derby – but planning your boutfit and trash-talking the other team on facebook don’t quite cut the mustard when it comes to visualization for sport. The current thinking among sport psychologists is that there are shared areas in the brain which can be activated by physical movement, AND by imagining the same movement (see footnotes). This shared patterning is termed “functional equivalence,” and our goal in sports visualization is to make our mental picture as close as possible to the physical reality of our movement, for the greatest benefit. Physical – picture your physical self, in your skates, uniform, and gear, mouthguard in, teammates around you. 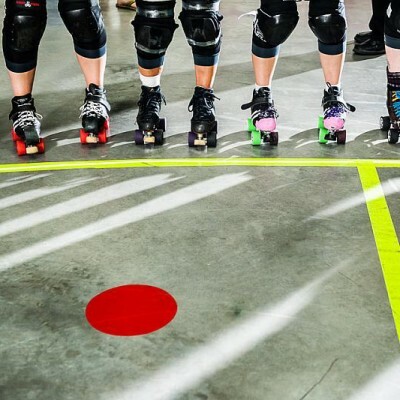 Task – imagine details “relevant to the task”, like the actions of other skaters, paying attention to their jammer AND the incoming offensive player, the track lines, etc. Don’t imagine yourself playing against elite skaters unless you’re at that level – everything about your imagery should be specific to the situations you are likely to experience yourself. Timing – real-time imagery seems to be the most effective way to achieve functional equivalence in your brain, but it can also be effective to run certain elements or skills in slow-mo: say, approaching the pack and squeaking across the inside line on your toe stoppers. 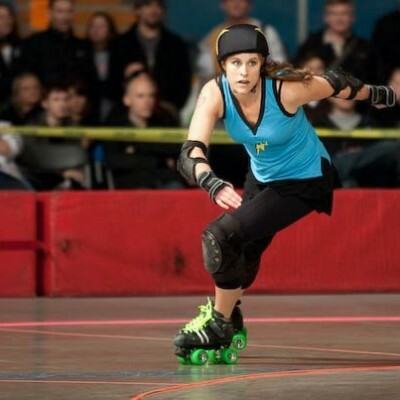 A jammer may want to slow that down to mentally review each step in the sequence. But then review it again in real time to cement the image. Learning – change your visualization script over time to adapt to your own skill improvements – as you get better in real life, don’t forget to make yourself better in your imagination too! Emotion – include the emotions you are likely to feel on the track, in your mental script. Stick to positive emotions like adrenaline and determination, rather than fear or nervousness. 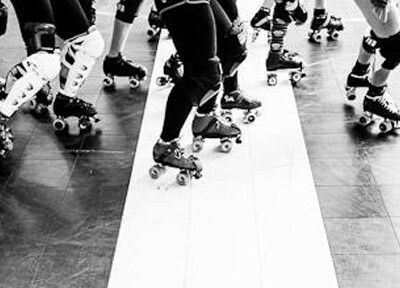 Perspective – use a first person perspective for skills that involve timing (like a juke, or conversely stepping into an oncoming jammer), and a third person perspective, in other words like seeing yourself on film, for skills that involve positioning, like reconnecting with your wall, or skating very low. Either way, plan in advance whether you will see the game unfold from your own eyes on the track, or from an outside perspective, before you begin your visualization. If you can optimize these 7 elements and create a derby visualisation script for your own regular review, you will see steady improvement in your game and skills that you would not be able to achieve with physical training alone. I’ve been watching lots of the Olympic athletes do quick versions of these visualisations right before their run on the moguls, halfpipe, or slopestyle course. It’s clearly a critical part of their training, and their routine pre-event. You and your team can do this too! A simple script that you have practiced on your own can be run in your locker room before you get out on the track together. Do you practice mental rehearsals already? Join the conversation in the comments below. What are you favourite tricks?? PS: If you want more on how to imagine yourself as a winner, read this post, and Stop Sucking, Start Winning. Feeling inspired? Check out my Pump Up Your Jam and RDA:CoreBuilder training programs and take your physical game to the next level. I like to use visualizations on 2 levels – skill based and game based. To help me master a new skill, I’ll rehearse the successful execution of just that one thing – say, an effective offensive move to open a hole for my jammer – over and over. When it’s bout season, I take time to rehearse the plays and strategies that my team has worked on – these sessions take longer because they’re more complex. My team usually tries to do these on our own in the days leading up to a bout, and we also take time in the locker room pre-bout to do one all together.